So, you would have read our previous article on the Agile methodology (if you haven’t, do check it out) and are maybe looking forward to implementing it in your team as well. If you remember rightly, we mentioned some sub-models of Agile, namely Scrum, Kanban, Crystal and so on, which come under Agile but vary a lot. Are you confused as to what is the difference between each of them? Well, this article is to compare and contrast Agile and its most popular sub-model, Scrum with respect to their process, development structure and applications so that you get a clear idea as to which is a better fit for your organization. First things first, let’s get this straight: Scrum comes under Agile. Both are software technology development strategies that have a flexible approach to project completion when compared to contemporary methods (often known as ‘waterfall’ methodology). They aim to enhance customer satisfaction and product quality by the means of iterative work cycles and constant feedback. We can say in a way that Scrum is a form of implementation of Agile. Before we deal with the differences, let us brush up briefly on what the two actually are. Agile is based on a form of development cycle known as iteration, wherein work is done in the form of short, repetitive bursts. The Agile team is expected to have a professionally sound team leader, who is responsible for all work done by the team. Constant user feedback forms the backbone of this framework, thereby promoting regular delivery of the product or software to those who will eventually be the ones to use it. Simplicity is a highly coveted trait with regards to the entire process. In accordance with its core principles, Agile looks to put individuals and interactions before processes and tools, working software over comprehensive documentation, customer collaboration over contract negotiation and responding to change over following a plan. As you can figure out, Agile introduces a degree of flexibility or agility to traditional design strategies and values humans highly over inanimate factors. 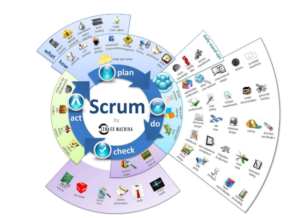 As stated earlier, Scrum is one of the implementations of Agile. Work is carried out in short ‘sprints’, lasting up to 2-4 weeks each. Daily Scrum meetings are held to keep regular tabs on the work completed and what has to be done in future. Every Scrum team consists of a development team, Scrum master and product owner, each with their own responsibilities. The Product master is the one who prepares the product backlog (which is a list of tasks that need to be completed in order to fulfill the requirements of the end product) and manages it. The Scrum Master facilitates the backlog to the Development Team, who complete the tasks in their desired order. Within the team, there is no hierarchy or division of labor as such, as the given work is supposed to be completed by the team as a whole in an order they deem fit. Flexibility is a key factor behind Scrum’s success, as it is immune to frequent design changes which can be implemented in the next sprint itself. The main values that drive Scrum are self-organization, collaboration, time-boxing, and iterative development. Agile and Scrum may look same a lot because, in a way, they are. But there are a lot of important differences that set each apart from the other and make them unique. If you want to adopt one of them, it is only fair that you analyze both and decide which one will suit your requirements better. Firstly, we must know which framework works well in which situation. Agile works ideally in cases where you have a small, well experienced and expert development team, whereas Scrum works best in a situation where the end requirement keeps changing rapidly. In Agile, the leader is accountable for the work done (or not done) by the team; in Scrum, there is no ‘team leader’ as such as all members of the team are expected to get the job done in a self-organized manner and hence all of them are responsible for it. In the former, the completed job is frequently sent out to the end user in order to gather feedback. Scrum follows the same but in a more orderly fashion, wherein a build is shown to the user at the end of every sprint cycle. 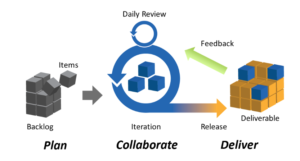 While in Agile the processes are kept simple, Scrum allows for experimentation and innovation. As mentioned earlier, working software is of utmost value in the Agile framework, whereas this might not be the case in organizations working with Scrum. Also in the latter, the next sprint is planned only after the completion of the current one. We can say that Scrum is a more refined form of Agile which takes its core principles from Agile while adding a twist of its own in order to formulate a strategy that is a lot more different. Both start with some kind of requirement and strive to deliver products or software of high quality, but employ slightly different ways to do so. And like every other methodology, they have their shortcomings too. As stated multiple times, Agile puts enormous value on working software, thereby disregarding the need for proper documentation. This may appear minor, but some form of documentation is needed so that new members or outsiders to the team can understand easily what’s going on. Since constant feedback and numerous interactions are required to set any piece of work in progress, it can be time-consuming as well. Agile has a tendency to fail when it is tested out on large, traditional organizations or teams or when the team leader is incompetent to handle things efficiently under pressure. While Scrum is designed to weed out the shortcomings of Agile, it is virtually impossible to do so completely. For example, since the entire team is supposed to get work done effectively if the group is not up to the mark, not so motivated or lack cross-functional skills, it can be very difficult to proceed. The short duration of sprints may put a lot of pressure on the team if not managed properly. Also, the project backlog, if not defined properly, will be virtually useless and end up as a hindrance to the whole development process. So it is clear that both methodologies share a lot of common points, vary substantially, enable development to be carried out in an effective manner and at the same time, have their cons too. Has you or your team worked with any of these methodologies or another similar one, such as Kanban for example? Comment your experience and thoughts below and for more details on the usage of these methodologies, Contact us!